Automatic teacher timesavers that do all the work for you! Student notebook labels, class lists, gradebooks, and more, created for you in a flash! These instant, editable autofill resources will save you tons of precious planning time. With each of these resources, you type your information just once, and the rest of the pages are automatically filled with your info, so you can just print and go! 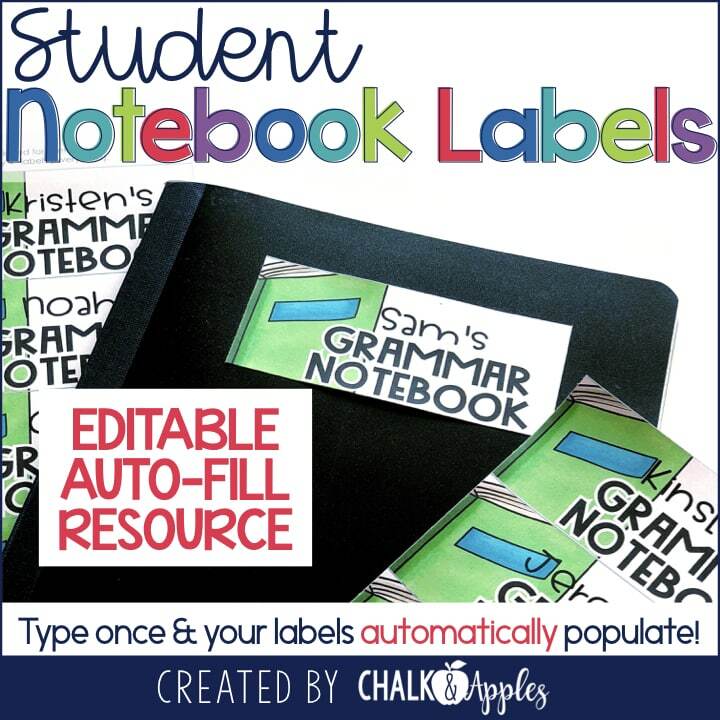 Automatically generate student notebook and folder labels for your class! Let these editable, autofill student notebook labels do the work for you! You just type your student information once on the main roster, and this resource automatically makes a class set of over 40 different labels for your students’ notebooks, journals, & folders. Automatically generate gradebook pages and class lists! 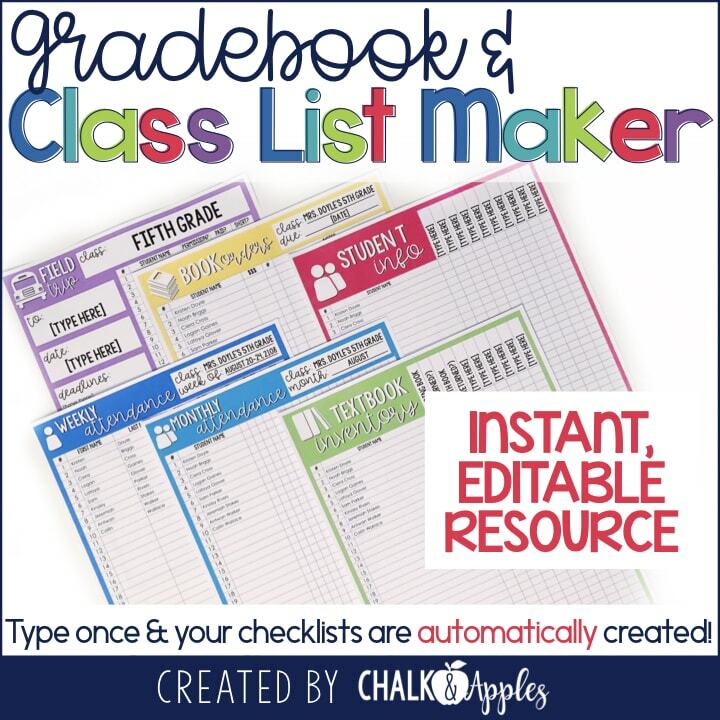 Let this editable, autofill gradebook & class list generator get you organized in a snap! You just type your class & student information once on the main roster, and this resource automatically makes 36 pages of gradebooks and class lists. 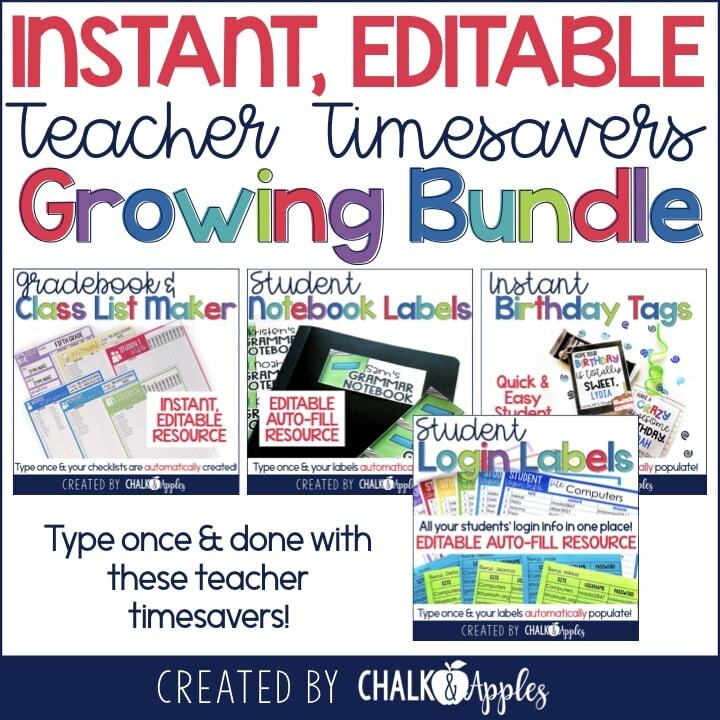 Includes 11 gradebook pages: Reading, Writing, Math, Science, & Social Studies, plus 6 blank, editable pages so you can enter your own class names. Also includes 25 class lists (some in full and half page options): Attendance, Homework, Signed papers, Substitute record, Lunch count, Turn in rosters, & more. 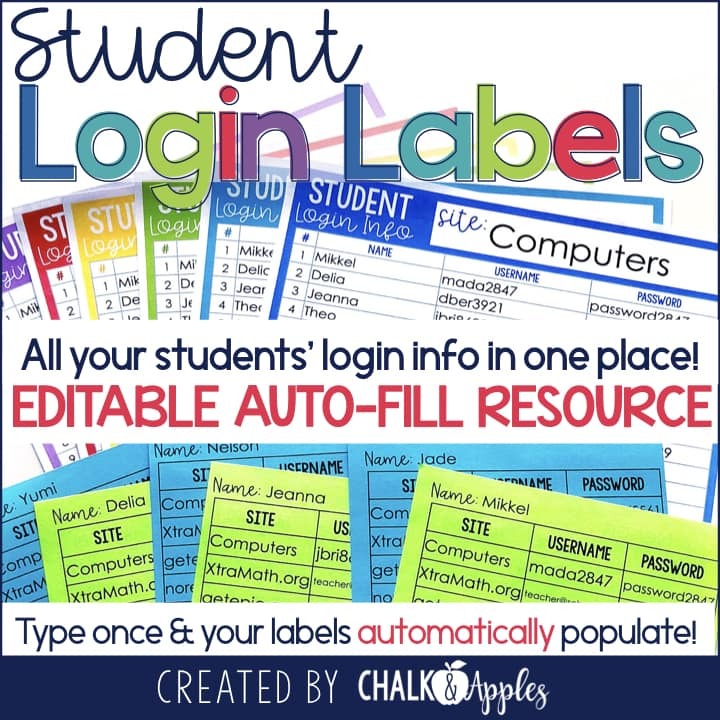 Automatically generate student login and password labels for your class! Let these editable, autofill student login labels do the work for you! You just type your student information once on the master lists, and this resource automatically fills it into individual student login cards. Print these login & password cards on full page label sheets (like Avery 8165 or 4332) and stick them inside students’ homework folders or agendas so that they always have them handy. You can also print on cardstock and laminate to keep in the classroom. Automatically generate student birthday gift tags for your entire class! Let these editable, autofill birthday tags do the work for you! 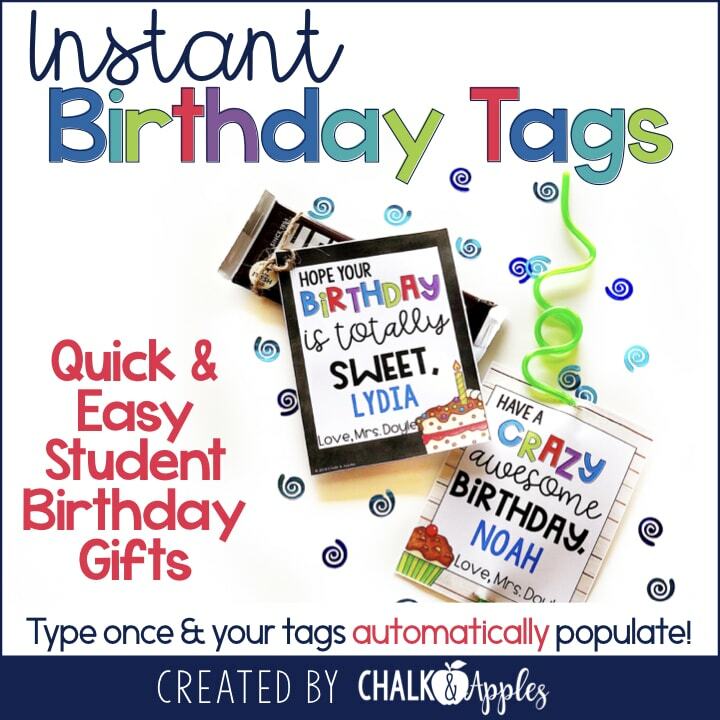 You just type your student names and birthdays once on the main roster, type your signature once, and this resource automatically makes a class set of birthday gift tags in 2 styles. Each style comes in color or black ink only for printing on your favorite bright colored cardstock. Simply add a crazy straw or candy bar, and your birthday gifts for the year are finished in minutes! 1. Open your downloads folder. 2. Right click this file. 4. Select Adobe Acrobat Reader. Also, for all resources that print on Avery labels, you must select “actual size” in the print window before printing. If you select “fit to page” or “shrink oversized pages” your printer will change the size of the images, and they will not fit correctly onto the labels.